The Northstar Gallery "Of Flesh and Stone" explores the connections between the sensuous female forms that adorn many of the great cemeteries of the world and the human form that the figures represent. For many years I have been photographing memorial art from around the world. This project explores the conscious and unconscious themes and symbolic content of memorial art. At issue is of course man's struggle with transcendence and his own mortality. As the project progressed, I began to discover many very sensual images of beautiful young women depicted in the memorial art in the cemeteries of Paris, Rome, Milan, Genova and Moscow. Certainly sensuous figures are linked to a long tradition in Western art celebrating the female form in both secular and religious settings. However, very intriguing questions emerged around the significance of this particular art form in the cemetery. 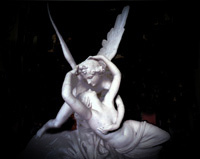 How is it that these very powerful images have come to offer solace at times of loss, what is the significance of the link between Thantos and Eros in this very compelling art form? The Egyptians held the belief that the preservation of the body was essential for eternal life, however simply preserving the body was not enough. It was believed that If the likeness of the king was also preserved, it was more certain that he would continue to live in the after life. So sculptors would chisel the person's likeness out of hard, imperishable granite, and put it in the tomb where it would reside unobserved. There it would work its spell, helping the person's soul stay alive through the image. In fact, the Egyptian word for sculptor was actually "He-who-keeps-alive’. At first these rites were reserved for kings, but soon the nobles of the royal household had their minor tombs grouped in neat rows round the mound. Gradually every upper class person had to make provision for his after-life by ordering a costly grave which would house his mummy and his likeness, and thus would be where his soul would reside for eternity. Often it was the custom, that when a powerful man died, his wives, servants, pets and slaves would be required to accompany him into the grave. They were sacrificed so that he should arrive in the beyond with a suitable entourage. 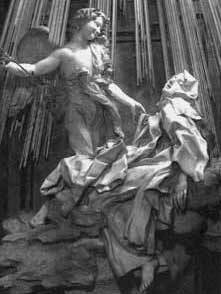 Later, this practice was considered either too cruel or too costly and images and statues replaced the living souls. We no longer believe that the symbol becomes the object and our attraction to this art form resonates with other meanings. There are many myths and tales of humans being turned to stone. The Medusa myth is one of the most relevant to this issue. The Gorgons were three sisters. Two of the sisters were monstrous with huge teeth, brazen claws and snakey hair. Sthenno and Eurayale were immortal, but Medusa, the third was mortal. Medusa, was a beautiful maiden who's hair was her crowning glory. She was loved by the god Poseidon in the temple of Athena. Athena was deeply angered and turned Medusa into a monster and changed her glorious hair into snakes. Athena made Medusa so ugly that that anyone who looked at her was instantly turned to stone. All around Medusa's cavern were stone figures of men and animals which had risked a glimpse her and had been petrified with the sight. Athena sent Perseus to slay Medusa, she lent him her shiny shield and Hermes lent him her winged shoes. Perseus approached Medusa while she slept and taking care not to look directly at her, guided by her image reflected in the bright shield, he cut off her head and gave it to Athena. In her ugliness, Medusa was the grand sculptor, a creator of stone figures, immortalizing the flesh of her victims by turning it into stone? For more images and information on gargoyles and grotesques, click here. In Genesis 19:15-24 Lot's wife is turned to stone. With the coming of dawn, the angels urged Lot, saying, "Hurry! Take your wife and your two daughters who are here, or you will be swept away when the city is punished." ..... When he hesitated, the men grasped his hand and the hands of his wife and of his two daughters and led them safely out of the city, for the Lord was merciful to them. As soon as they had brought them out, one of them said, "Flee for your lives! Don't look back, and don't stop anywhere in the plain! Flee to the mountains or you will be swept away!" By the time Lot reached Zoar, the sun had risen over the land. Then the Lord rained down burning sulfur on Sodom and Gomorrah-from out of the heavens. Thus he overthrew those cities and the entire plain, including all those living in the cities-and also the vegetation in the land. But Lot's wife looked back, and she became a pillar of salt. Transformation from stone to flesh is referenced in Ezekiel chapter 36 "I will give you a new heart and put a new spirit in you; I will remove from you your heart of stone and give you a heart of flesh." Zechariah, chapter 7, states "...they refused to pay attention; stubbornly they turned their backs and stopped up their ears. They made their hearts as hard as flint and would not listen to the law or to the words that the Lord Almighty had sent by His Spirit through the earlier prophets. Unlike stone, the flesh has the free will to choose, to be sinner or saint. 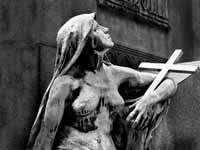 Some argue that the sensuous, beautiful young women cast in stone are the embodiment of death itself, the ultimate state of the flesh. The romantic notion "Sweet is death who comes as a lover" removes the sting of death and presents it as an experience to be fully embraced and welcomed. In Angkor - Splendors of the Khmer Civilization, Marilla Albanese observes "The artistic perfection of the statue does not fulfill aesthetic so much as canonical and ritual requirements because manufacture in accordance with the rules induces the Deity to descend into the stone and animate it with its presence, while the beauty of its form attracts worshippers and gives them aesthetic pleasure, the first emotion that prepares them for the encounter with the sacred. The deeper the spirituality of he who contemplates, the greater his ability to go beyond the formal aspect of that specific deity, perceiving behind it the the ineffable presence of that which has no form and no name." 63. "The Khmer, as a megalithic civilization inaugurated a cult of stone that gradually increased over the centuries as a result of external (mainly Indian) influences and eventually acquired central importance in Khmer history. Menhirs were erected as funeral monuments, probably to commemorate the deceased and transfer his energy and charisma to his successor. The upward-pointing stones acted as an intermediary between heaven and earth and the emblem of a supernatural presence that controlled and fertilized the surrounding land. They consequently become a tangible symbol of the invisible genius loci, or local spirit. Ancestor worship and the cult of the chthonic powers this merged in the menhirs, which at the same time acquired land survey functions, marking the ownership and boundaries of land." 64. The role of the stone statue as sacred Deity transitioned to becoming the image of the King who increasingly took on the identity of the Deity in the final stage of the Khmer Civilization. 62. Albanese adds: "In his desire for immortality and revealed by his frenzied building campaign, Jayavarman erected statues of himself all over the country. Jayavarman identified his mother with the goddess Prajnaparamita, the mistress of supreme Buddhist knowledge, and his father with the bodhisattva Lokeshvara, of whom the Emperor considered himself the incarnation. However, it was not only the royal family who sought immortality; as if they had had a presentiment of the end, princes, dignitaries, and officials filled the temples with their own statues, hoping in this way to cheat time as Angkor began its ineluctable decline" 62. ... and flesh became stone. In this framework one is interested to consider whether it matters if the subject of a fine art photograph is flesh or stone. Is it useful for the viewer to know the ultimate nature of the subject? There is also a fascinating dynamic, for in some venues a figurative image of a stone subject will be acceptable but not a similar image of a human subject. 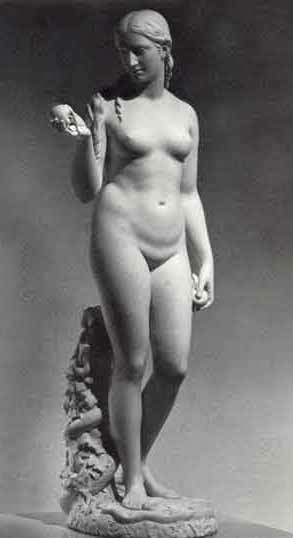 At some level are we repeating the Medusa myth in the transformation of beautiful women to stone? The warning of the Medusa myth is that one can lose all if one is too enamored with earthly beauty. As the project has progressed intriguing questions about the nature of the stone figures emerge. 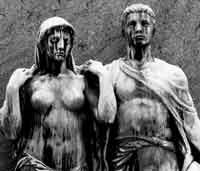 Though they represent some of the most beautiful of young women, the marble and granite statues have none of the qualities of the flesh they represent. Yet, the stone figures communicate profound themes about mortality, renewal, birth, rebirth, salvation, transcendence and transformation. What are the perceptual qualities that allow a symbol of something to have a such a powerful transcendent message? In some ways the symbol communicates ideas that the object cannot. Is there a connection with the biblical warning "for dust you are and to dust you will return." and a realization that flesh and stone are ultimately and profoundly connected. In stone there is a reminder that all that makes flesh so different from granite and marble is profoundly transient and fleeting. 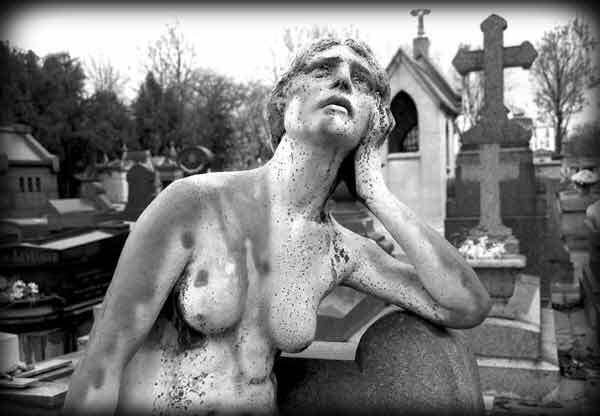 The beautiful figures of the pyramids and the women of the cemetery are immune to the exquisite fragility of the flesh they represent and as such aspire to enduring themes. Yet, Auguste Rodin observed "The human body is first and foremost a mirror to the soul and its greatest beauty comes from that". Similarly Walt Whitman offered: "If anything is sacred, the human body is sacred." These images of flesh and stone explore a collective yearning to understand the human condition, our vulnerability, our mortality, our capacity for renewal and redemption and the terror of the unknown. These are the deep issues seeking transcendence and result in a profound desire to understand the meaning of our existence. Such passion is at the foundation of the great art of the Western World and our ultimate hope that the universe is not random. Your death is always with you and it is the most attractive part of you. When people tell you they love your eyes, Or the way you walk, It is your mortality they're seeing. A collection of fine art photography of exploring the theme "Of Flesh and Stone". Comments on "Of Flesh and Stone"
Albanese, Marilla. (2002) Angkor - Splendors of the Khmer Civilization, New York: Barnes & Nobel.